Up to 1,300 homeowners face losing part of their gardens under radical plans to widen streets and improve the capital's bus service. The National Transport Authority (NTA) will today outline proposals to develop 230km of dedicated bus corridors and more than 200km of cycle paths across the city, which will require gardens or parts of gardens to be acquired to allow roads to be widened. 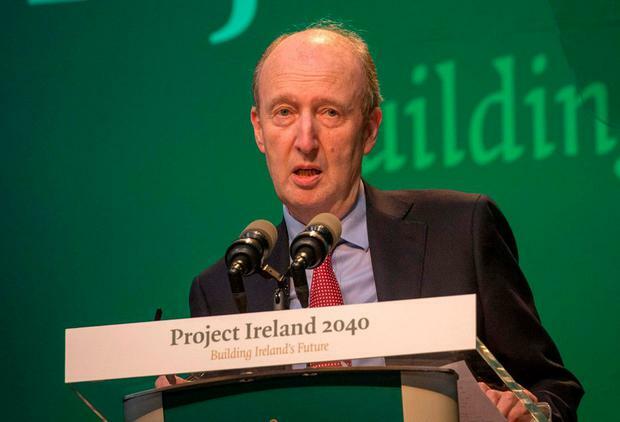 The Bus Connects project, announced last year by Transport Minister Shane Ross, aims to develop 16 dedicated bus corridors where public transport will have continuous priority, improving journey times by between 40pc and 60pc. A discussion document to be published today will state that the likely cost of the new corridors and cycle paths will range from €1bn to €1.5bn, making it among the biggest public transport projects ever undertaken in the State. Congestion is now among the biggest issues facing bus companies operating in the city, with Dublin Bus and Bus Éireann carrying 147 million passengers last year - 67pc of all public transport journeys. But just 30pc of key bus corridors enjoy uninterrupted priority, resulting in services being caught up in gridlock. The NTA wants to widen streets to accommodate pedestrians, cyclists using a dedicated lane, bus passengers on priority routes and general traffic. 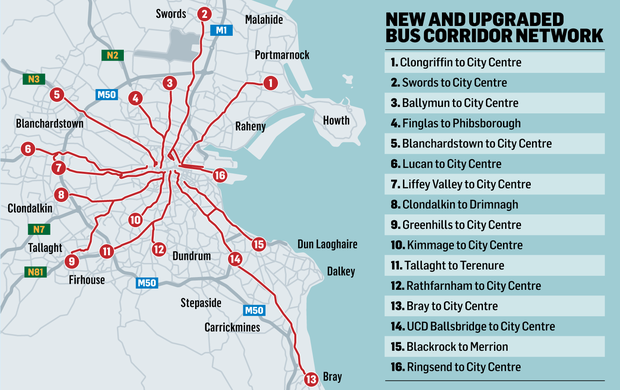 Four routes are planned on the northside between Clongriffin, Swords, Ballymun and the city centre, and Finglas to Phibsborough. To the west, four are planned from Blanchardstown, Lucan, Liffey Valley and the city centre, and between Clondalkin and Drimnagh. In the south, direct routes into the city centre are planned between Greenhills, Kimmage, Rathfarnham, Bray, UCD/Ballsbridge and Ringsend, along with two additional corridors between Blackrock and Merrion, and Tallaght to Terenure. But there will be impacts for property owners during construction and after the project is completed. Planning permission is expected to be sought late next year. As many as 1,300 property owners face losing parts of their gardens so roads can be widened. NTA sources suggested compensation would be paid, and gardens landscaped, but that some property might be acquired using compulsory purchase orders (CPOs) if agreement cannot be reached. The total project could take up to 10 years to implement, and traffic disruption will arise during works. In addition, once complete it may result in some roads becoming one way. Among the key challenges identified by the NTA include acquisition of properties, a reduction of on-street parking both public and private, removal of trees and re-routing of traffic. The plans will be put out for formal public consultation in September or October. Next month, the NTA will also begin a full public consultation on a complete redesign of the Dublin Bus network, which will include re-routing of existing services, changing bus stops and re-numbering of bus routes. This also forms part of the Bus Connects project. Dublin North West Deputy Noel Rock this morning slammed the National Transport Authority for keeping households in the dark as to how the new routes will impact on their premises. "I understand that the NTA intends to publish plans to acquire, via CPO, a portion of some 1,300 gardens," he said in a statement. "They intend to announce this plan, yet have not informed residents affected, and have no plans to do so before then. "Similarly, their own report doesn’t outline exactly which properties will be affected by the acquisition; rather it only outlines the roads affected. "This means instead of 1,300 households being informed on this matter and becoming concerned due to the lack of direct engagement from the NTA, it will be a multiple of several times that."